Free crochet patterns, learn how to crochet spirals, crochet spiral fringe, crochet for beginners, curly fringe to crochet, crochet corkscrew, crochet borders, free crochet edgings, fringe that easy to work around the corner. In this crochet video tutorial you will see a great way to end your pattern with a crochet spiral fringe edging. 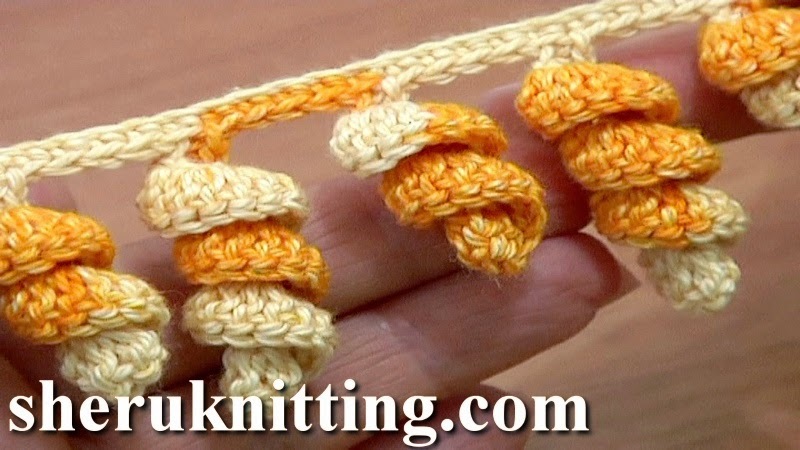 Easy to crochet spirals made of double crochet stitches. You can make your spirals very long to create a nice curly fringe, for this just begin the spiral with a long chain. These beautiful spirals are really fast and easy to crochet. Thanks for watching! Edging was made with Crochet Hook 2.25mm (which is #2 US standard) and with yarn: 55% Cotton, 45% Poly Acryli, 160m/50g.